From the latest polls it doesn't seem so, or there are not very many of them. Best NDP argument against the pipeline is that it is shipping jobs out of Canada. Another argument is the bulldozing of provincial rights. I think most Canadians want their municipal and provincial laws to be respected. The argument that democracy is undermined by BC thwarting the pipeline is nonsense. It is just the opposite. Democracy is being strengthened. Disputes are settled through dialog not force. If Alberta cannot convince BC to support or allow the pipeline then it shouldn't go through. It is not the business of the other provinces. May 31st is not an arbitrary date. They don't want to miss this year's construction season because it increases costs. They are going to miss it. There is no way this will be settled by May 31st. The First Nations cases haven't even reached the Supreme Court yet. Imagine that! Liberals and NDPs getting elected by using public sympathy for our oppressed indigenous people, and even their votes themselves, and then sticking a pipeline right up their... uh mountains. Imagine what they are going to do to you next! Ahh. Progressives. Aren't you such wonderful people! So loving, caring, and always concerned about the Greater Good. I think most Canadians want their municipal and provincial laws to be respected. ​However, there is a hierarchy of laws. The BC government would never allow a municipal regulation to interfere with what the province wanted to do. Municipal laws are subservient to provincial law, as provincial law is subservient to federal law. It couldn't really be any other way. If municipal law was a higher authority than provincial law, why bother with a province? And if provincial law was superior to federal law, what's the point of the federation? Now, before you get carried away, I do know that there are areas of jurisdiction that are provincial. One of the things that is not, is interprovincial trade. For a guy whose handle is progressive17, I find it strange that you'd take a ring wingish shot at progressives. Unless you were simply being ironic. Certainly not something I would say,even in jest. If interprovincial trade is federal, why are provinces allowed to block things like unions from other provinces, and goods? I see it as having to satisfy all levels of government. I support a cooperative approach not a coercive one. The federal government would never get away with forcing a pipeline through Quebec. The same should be true for BC and every other province. So far all I am seeing a whole bunch of political posturing. Alberta will not follow through on limiting oil and gas shipments to BC. True enough, Notley’s Bill 12 does not itself discriminate against British Columbia. But she has made it abundantly clear that it is entirely aimed at authorizing by regulation the discriminatory export of oil and gas to B.C. Something that is explicitly forbidden by Canada’s highest law. The one that she either hasn’t read, has misread, or simply hopes to wish away. Not unlike her misreading and wishful thinking on the Kinder Morgan project itself. It is the same Canadian constitution that the government of Canada has also discounted at every turn, in ignoring its fiduciary and legal obligations to Indigenous peoples and in assailing B.C.’s efforts to seek legal clarity about its constitutional jurisdiction. The one and same constitution that the Trudeau government would be so obviously obliged to uphold, in overriding Alberta’s sorry excuse for constitution-breaking, if Notley ever had the temerity to bring down her legislative “sword of Damocles” on B.C. as she envisions. Prime Minister Justin Trudeau frequently expresses his concern for First Nations people, but he has no problem forcing a pipeline on Indigenous bands who have refused to provide consent. Not that I expect to hear a word to that effect from any of Trudeau’s sorry lot, any more than they were inclined to chastise Alberta for breaking trade laws with its first wine war. Trudeau’s principles are as malleable as his environmental “convictions”—and equally bent to the will of Big Oil, which in Canada, rules all. Never mind that if the imagined powers authorized by Bill 12 are ever invoked to penalize B.C., it will effectively start an international energy trade war with Washington state refineries and other customers. They are, of course, reliant on their contracted volumes flowing through the existing Trans Mountain pipeline, which would be severely impacted by any “licensed” export restrictions that Notley might hope to impose on volumes bound for or through B.C. Set aside the lawsuits that would trigger and the added delays that would surely entail for all of those frustrated tarsands producers that hope to see more of their filthy product somehow poured out in ever greater volumes to Pacific tidewater. I don’t believe for a second that if Notley ever tries to license, regulate, and restrict her own province’s oil producers as she is now threatening that there would not be a rapid revolt in Alberta by all those companies whose oxes would be so arbitrarily gored. No matter. Pretend, if you will, that Bill 12 could be wielded as threatened without instantly creating a full-blown constitutional crisis, backed by Quebec, that would rapidly convince Canada’s out-in-the-wilderness prime minister to fold his already shaky camp stool. Give him some credit. He might seem like a coward, but when push comes to shove, he knows damn well who has the most muscle, and it sure ain’t Alberta. It’s Quebec, Ontario, and First Nations. As an accomplished boxer, Trudeau knows full well that “rope-a-dope” only works so long before a knockout blow connects. The attack on Bill 12 will be fast and furious if that lame jab at B.C. is ever suffered upon our entire nation, if only for the precedent it would set. Which Quebec and Ontario could never abide without a serious fight. Forget all that. The point is, fortunately for British Columbians and for all Canadians, we have a constitution that is the highest law of the land. Just as it will be used by First Nations to legally assert and uphold their constitutionally enshrined rights and title—and as it will be used by B.C. to protect its constitutionally delineated jurisdiction—Canada’s ultimate law will surely sink Bill 12. If only after that bill does a lot of damage, including to Alberta’s global reputation. Meanwhile, Kinder Morgan will be literally laughing all the way to the bank in Texas. Stupid, stupid Canadians, it must be thinking. They are such pushovers. Once an American colony, always an American colony. A branch-plant economy that will perhaps never find its nerve or will to stand up to the biggest bully on whom it depends for its lunch money. Where would Big Oil be without Canada’s easily browbeaten prime minister? The one who recklessly declared its latest sinking pet project to be a vital enterprise in the national interest, which is simply too big to fail. Talk about an easy mark. He has basically put Kinder Morgan in the envious position of dictating how large it wants Ottawa’s cheque to be, to cover its margins and keep its dog-of-a-project “on track”. Trudeau brought a nail file to a knife fight that is in serious danger of literally morphing into a potential gun fight. That is, if the worst and most dire threats of some First Nations leaders are to be taken at face value. He has backed himself to the edge of the cliff that he now seems determined to pitch himself and Canadians off, offsetting Kinder Morgan’s risk at all costs with billions of taxpayer dollars that his government would effectively have to steal from other crucial public services. Canada’s first Emperor Trudeau said “just watch me,” in acting to save Canada from the terrorist FLQ that was murdering people and was vowing to rip our country apart. His child emperor has pretty much embraced that phrase as his governing credo. Because watching him is what’s it’s all about for Justin Trudeau: staying busy at looking busy, and doing nothing but breaking hearts wherever he does do anything substantive. Bailing out Big Oil to the tune of billions of dollars, which Kinder Morgan’s shareholders now bear the sole risk of losing? Thumbing your nose at Canada’s First Peoples and vowing to run pipelines across their unceded territory, in wanton violation of their wishes and of their internationally acknowledged human rights? Jumping as high as commanded by Kinder Morgan, to meet its arbitrary May 31 deadline? I stress: dead. Line. No bar too high, Trudeau happily says, however hard the fall for future generations that will have to pay for that error of judgement and hubris. By May 31, you say, Houston? We have a problem. But nothing that Trudeau can’t solve with taxpayers’ money and his “sunny ways” at the bargaining table. All to kickstart Kinder Morgan’s uneconomic, massively disruptive, environmentally destructive, socially irresponsible, and anti-climatic tarsands pipeline. Albeit taxpayers’ money. But who's to know better when money has never been any object? What’s a few billion more of debt for future taxpayers when you were born with a silver spoon in your mouth? When the closest you ever got to really going over an edge from which there is no recovery was on a snowboard at Whistler? Sadly, all the world can now see what is really going on. It is the failure of leadership from Trudeau and Notley that threatens to make fools of us all, as it confirms Canada as a climate-action fraud. The emperor has no clothes, I suggest. Be it the one occupying the prime minister’s office in Ottawa, or the tiny Tories of all political stripes in Edmonton. All of them are laughably compromised by Notley’s latest pathetic attempt to bully British Columbians and First Nations, on a pipeline for no one that is going nowhere fast. If anything is really out of gas, it is the Kinder Morgan project, which Bill 12 makes its own argument for stopping. Now. In the national interest. Alberta will not follow through on limiting oil and gas shipments to BC. So where will the oil and gas be stockpiled, or will production be reduced? I find it quite interesting that Alberta is willing to prevent private companies from selling to a major customer, illegally I might add. That will reduce revenues to both oil companies and the province. Not exactly a business friendly move to reduce oil company revenues. It sets a huge and radical precedence to prevent companies from selling product to another province. I doubt it will encourage investment. But hey, if Alberta wants to cut of its nose to spite its face I'm sure BC will survive it. If anything it will increase opposition because giving it would mean Alberta would have BC over a barrel not just over this pipeline but for anything else Alberta wanted to demand in future. Cutting off the oil to BC means cutting off what is currently exported off the BC coast so whomever is buying that oil would also be cut off. From an environmentalist point of view, not a problem. From a business perspective, not good for the Alberta oil industry. As if BC would allow bitumen to flow through the province for export after Alberta cuts BC off the refined products. It's all sabre rattling. The bottomline is that BC has the legal right to put a reference question to the Supreme Court. There is nothing Trudeau or Notley can do about it. There's nothing Trudeau or Notley can do about it. I very much appreciate you including Notley in this. Not many people are doing so. She seems to be getting a free pass because she's an alleged New Democrat. The reality is that she's as right wing as any Alberta politician and she is the biggest hardliner for this pipeline. Thanks for noticing that fact. On every issue, she's as right-wing as Jason Kenney? Just the usual Liberal nonsense! The Trudeau government won’t rule out full public financing for the Trans Mountain pipeline. What else could Canada buy? The news shocked conservatives and oil tanker opponents alike: Ottawa is considering a full taxpayer bailout for Kinder Morgan. The Texas company – run by former Enron executives – hit pause on its B.C. pipeline project last week. Classic 1953 pipeline for sale. Some rust. She's the biggest hardliner for this pipeline left of Kenney. Which doesn't say much considering Kenney is so right wing he's a fascist. I didn't call her a fascist. She's a sad excuse for a New Democrat. The Alberta NDP is nothing more or less the ressurrection of the Wild Rose Party. She is,and make no mistake about it,right wing. I never said you called her a fascist. I asked if you thought she was as right-wing as Kenney on every issue. Which she would have to be, to fit your claim of "...as rightwing as any Alberta politician". Besides pipelines, can you give me an example of some issues on which there is typically a left/right division, and on which Notley is as right-wing as Kenney? I'm going to be honest with you,VOTD. I don't know much about Alberta politics. BUt on this issue she's hard right. Are you really going to disagree? Please. He says that we will need to ween oursleves off fossil fuels and that rising prices are a big part of making that happen. However, the government by getting involved in this pipeline is interupting that process and creating a pro-carbon subsidy. "Canadian taxpayer money flowing straight into the pipeline creates the absurd situation where the vast majority of Canadians who wish to stop climate change will be contributing to a hidden pro-carbon tax that will bypass market forces to make climate change worse." It probably is not good governance to subsidize fossil fuels while trying to subsidize green energy. At the end of the day, the subsidies, from an environmental point of view, cancel each other out. On the other hand these subsidies may also be so inefficient that they do not serve to make energy cheaper or even serve a social affordability purpose overall either. The argument might be that this is stimulative to the economy. And it may be. So here is my question: should the NDP federally ask that the auditor general question the potential buy-in of Federal investment in the pipeline to see if this actually creates an economic net benefit, counteracting green investments. As well are there not other investments possible that could be made that would not counter federal policy regarding the environment and support more local economic activity than shipping oil to export? Perhaps, if you want a real solution, the auditor should be asked to weigh the economic benefit to Alberta of this pipeline against other potential investments that could be made there? To me these are basic quesitons because this is a potenital asset for Alberta and knowing the value of what it is being asked to give up measuing it against alternatives woudl seem like an essential step to any resolution. Unfortunately, I think we are not headed to a resolution so much as one side imposing on the other which will make any solution much harder. The fact that the federal government is taking a side rather than trying to find solutions is not helping. If the government is willing to help build the pipeline for Alberta why cannot it not measure what other than a piepline would bring Alberta even? How can reject the idea without even working out what this means and asking the questions? ..if this is true and i believe it is what are the options? Is the Oil Industry Canada's 'Deep State'? KEVIN TAFT: I wanted to give it a little bit of academic structure. So I linked it to the notion of institutional capture, which has a very long history in literature in which agencies of one kind of another set up to serve the public interest, regulators or government departments, or so on, end up serving the private interest instead of the public interest. KEVIN TAFT: My argument is that over 25 years or so, the oil industry has worked very hard to gain influence through various means over the federal level, over environment Canada, over natural resources Canada, over the prime minister's office. ADAM SCOTT: There's been numerous times when the federal government has said, "Okay, we're gonna deal with climate change, we're gonna put modest regulation in place for emissions," and we've seen time and time again where suddenly the government one minute is talking about doing climate policy, and the next minute it's gone. KEITH STEWART: They have a political influence that is way larger than their actual economic influence. But I think part of what they've done, is they've convinced government officials and many Canadians that they are a crucial part of the economy, when the reality is they're a small part. "What we're saying is if they (Alberta) turn off those taps, Saskatchewan won't be here to fill those (B.C.) fuel tanks." The sun shines in British Columbia. I'm glad to see that allies Rachel Notley and Scott Moe will both be putting their oil where the sun don't shine. Mark Sholz, of the Canadian Association of Oilwell Drilling Contractors, welcomes the proposed legislation. "I think it's very prudent and shows bold leadership on the part of the premier, and it's certainly something we're supporting as a direction or a strategy." Sholz said it's too bad it has come to this point, but everything possible needs to be done to ensure the pipeline expansion is built. "We need to ensure this pipeline gets built, and I think additional pressure to the government of British Columbia is important and it's a very meaningful signal, an impactful signal from the Alberta government," he said. "It's unfortunate that consumers are the ones that are going to have to pay for the irresponsible decisions and the foot dragging of the B.C. government." Falling prices and competition from a new Texas export terminal mean Trans Mountain fails the business test. 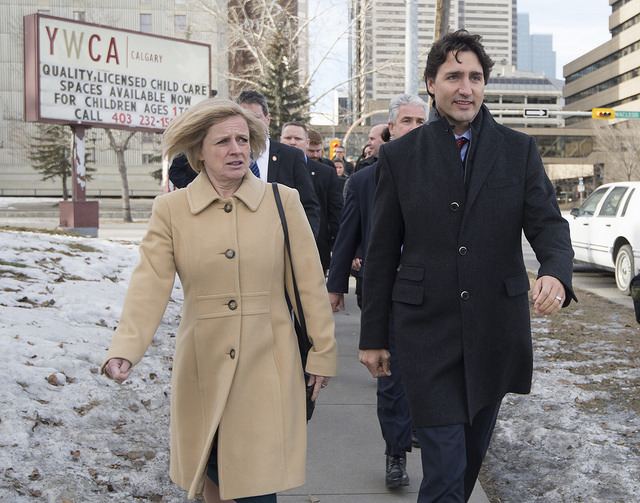 Rachel Notley and Justin Trudeau are prepared to pay for a pipeline that no longer makes economic sense. Photo from trumpvstrudeau, Creative Commons licensed. So? Of course there will be people with a mixture of opinions in any province (and even here on Rabble). British Columbians are almost evenly split in their support for Kinder Morgan, but I don't see you spamming the board with links to those facts NR. "We're at a point of crisis of confidence in Canada, a crisis that needs leadership and immediate attention to resolve," Greg D'Avignon, president and CEO of the Business Council of British Columbia, told reporters. Laura Jones, the executive vice-president of the Canadian Federation of Independent Business, accused the B.C. government of "creating mayhem and mischief with respect to a project that has already been approved." She said the federal government should use "every tool in its toolbox" to make sure the project goes through. The speakers Thursday also included one Lower Mainland politician. Abbotsford Mayor Henry Braun told reporters that he wants his grandchildren to grow up in a world less dependent on fossil fuels, but he also hopes their lives will be supported by a strong economy. "There comes a time when leadership has to stand up and say something at the local level, and that day for me is today," Braun said. Meanwhile, Dennis Connor of B.C. Clean Technology Industry Voices argued that protests against the pipeline are actually imperilling future action on climate change in Canada. "If the protesters, abetted by the province, stop the pipeline, we believe the climate accord will go away," Connor said. He said that while he strongly supports moving away from oil and gas as energy sources, it will take decades to complete the switch to renewable energy sources. In the worsening feud over Kinder Morgan’s Trans Mountain pipeline, British Columbia premier John Horgan could have more legal ground to stand on than his counterpart in Alberta has alleged, according to several constitutional law experts. I understand that the Federal Governemtn wants the pipeline. That is not the most grevious error here. It is a dispute. However, for a national government to stay silent while two provinces threaten another with an unconstitutional threat to prejudice them when it comes to exports is much more serious. It is a major problem that the federal government is supporting through silence a bid to damage the economy of another province in this way. I wonder when even the pro-pipeline people in BC will realize the seriousness of this situation where the Federal government is apparently condoning unconstitutional attacks like this. KEVIN TAFT: When that happens, democracy stops being democratic. What you end up with is an appearance of democracy, but really it's a state within a state. PAUL JAY: In Alberta, with the election of the NDP Rachel Notley government in 2015, the power of the oil industry was witnessed in how quickly the new premiere became a champion of its interests. KEVIN TAFT: Through her whole career and her whole party up until they became government were very effective critics, counterbalances to the oil industry. As soon as she stepped into office, as soon as she and her party became government, they've simply became instruments of the oil industry, in my view. As I said upthread I think this is correct. The problem is that a reference on the quesiton may not be adequate. The Federal Government position may be that there is no dispute becuase BC cannot prevent it and they do ot disagree with the BC government authority in terms of regulation. It could be that the BC government would have to introduce a regulation that the Federal government disagrees with (short of stopping it altogether) in order to have any purpose in a case -- which would then be based on how far the regulation can go or whether a given proposed regulation were actually a regulation or if it were a stalling or blocking attempt. At the same time I wonder why we are not hearing about an Indigenous reference which is where I think a stronger case on stopping the pipeline would be. British Columbia's attorney general is calling Alberta's proposed fuel restriction law a ``bluff'' that will result in an immediate lawsuit from his province and likely lawsuits from oil companies. Fossil fuels or the future? I am not sure. Why would oil companies sue? They want the pipeline. They would not necessarily be hurt all that much as they would increase the price due to scarecity and not lose all that much. If you think of it in labour terms it is less like a strike than a slowdown where you get to increase the price of the service in the process so you do not lose anything from what is not supplied. The lawsuit I agree is a thing. Even more of a thing would be a lawsuit against the federal government of encouraging and not preventing this. The threat is already an action with fuel prices in BC soaring. People are being sold a bill of goods. The price of gas will not be reduced in BC due to the completion of the Kinder Morgan pipeline expansion. If anything the cost of completing the pipeline expansion is going to increase gas prices in BC. How would increasing the capacity for petroleum products from Alberta to the Lower Mainland increase prices at the pumps? We have to understand the purpose of the new pipeline: to ship heavy oil — diluted bitumen — to the Westridge dock to be loaded on oil tankers and, according to Kinder Morgan, go to Asia. B.C. has no use for heavy oil. The light crude oil and refined products southern B.C. needs are delivered on an existing pipeline. If the expansion goes ahead, toll rates on the existing line will more than double. Right now, it costs about $2.50 a barrel to get gasoline to the Lower Mainland market and after the expansion, to help pay for the expansion that doesn't serve our market, it will go up to about $5.90 a barrel. That equates to about two cents per litre increase at the pumps. I've calculated that above $100 million a year will be siphoned away from our economy. How do you know toll rates are going to double? The National Energy Board has a toll rate hearing for any major pipeline like this. That hearing was held back around 2012 and all that data is on the NEB site. Do we know that Kinder Morgan won't be carrying more than diluted bitumen through the new pipeline capacity? Earlier this week, we talked about how they can send different batches of different of products down any pipeline. That's not what they told the National Energy Board. They told the board they were going to ship diluted bitumen, heavy oil, to the dock for export. The intention of this project is not to increase petroleum product supply. We get sufficient supply right now. This whole idea that somehow there is a scarcity of supply right now or historically in the last couple years is without merit. In fact, what Port Metro Vancouver's statistics tell us is that B.C. is a net exporter of gasoline to the U.S. The prices we see right now, we've been told is because of renovations or refurbishment at the refinery and that's having an impact on supply of the refined product — gasoline. Is that not the case here? No, that is not the case. There is no scarcity of supply and there is no bottleneck on the current system. Parkland refinery shut down for planned maintenance. Planning for this event started in 2013. The company says that it built up its stored volume of fuel in advance of the shutdown and it also entered into deals with others to ensure a consistent source of supply. We are being fed a story that is not consistent with the facts. Here are some even more helpful quotes from the same article. Tim McMillan, president of the Canadian Association of Petroleum Producers, said Alberta's hand was forced and producers are on board with Bill 12. But he noted that if the legislation is enacted, it wouldn't just hurt B.C. "Any disruption would have further effects on our industry, and I think it comes down to short-term challenges for long-term gain. Our preference is that we don't have barriers getting our product to market, short or long term," he said. "Any time there is a barrier getting the product to market, it hurts the economics in Western Canada and has an effect on jobs.". Gary Leach, president of the Explorers and Producers Association of Canada (EPAC), echoed McMillan's sentiments, and said he hopes the government handles any enactment of Bill 12 with "some skills" to avoid too much negative impact on Alberta's energy producers. "But, I think at this point this impasse with British Columbia has to be brought to an end as quickly as possible. So our view is that it's regrettable it's come to this, but we would support the government at least acquiring the legal tools to defend Alberta's interests if necessary." That isn't support for using the bill. Just having it. Getting them to agree that it is necessary is another matter. Another key industry group, the Canadian Energy Pipeline Association (CEPA), said in a statement that while it understands Bill 12 has become necessary, it's concerned the measures could have unintended consequences. "We hope that the measures will not need to be implemented and that we are able to find a prompt resolution to the current impasse that reflects the needs and concerns of industry and other stakeholders," CEPA president Chris Bloomer said. Again, support for the bill but coupled with a warning not to use it rooted in "unintended consequences". Alberta's ability to physically export bitumen is limited by transportation options. If Alberta decides to not sell to BC it doesn't have other customers waiting in the wings. BC can also shut down bitumen exports from its coast. Alberta is playing chicken. While BC gas might go up oil companies would have no choice but to reduce production and lay off workers. Trudeau and Notley better think twice about sinking money into the project. It is not guaranteed to go through. There are still cases before the courts that have not been settled aside from Horgan's reference question. Is this just profit-taking on the part of the oil companies? What we've got here is a classic situation of predatory or inappropriate pricing because the companies know what the markets here will bear. We are often charged more than costs and a normal return on profit and transportation would suggest. Consumers have to take action. We have to vote with our feet.